This service is fast, reliable, and great for streaming. It does keep some logs and lacks live chat customer support. The approach enables you to browse, stream, upload, and download at top speeds with no issues. We reviewed this service to see if it really measures up to its claims. Read on to find out how Speedify fares when it comes to price, security, speed, customer service, and more. Speedify offers a few different types of packages. First, you have the Starter Plan, which is completely free. It allows you 1GB of data and lets you connect just one device at a time. The Starter Plan likely won’t be enough for most users, but registration is not required to take advantage, so it could be a great way to try before you buy. One perk is you get access to the full network of worldwide servers, which is very uncommon for a free plan. To unlock unlimited data and connect up to five devices simultaneously, you’ll have to purchase a paid package. The Individuals plan can be paid for on a monthly or annual basis. Our readers can get a discount of 75% and pay $49.99 per year for the annual plan here. This works out to $4.17 per month. There is an additional option for a dedicated server for an extra $120 per month. 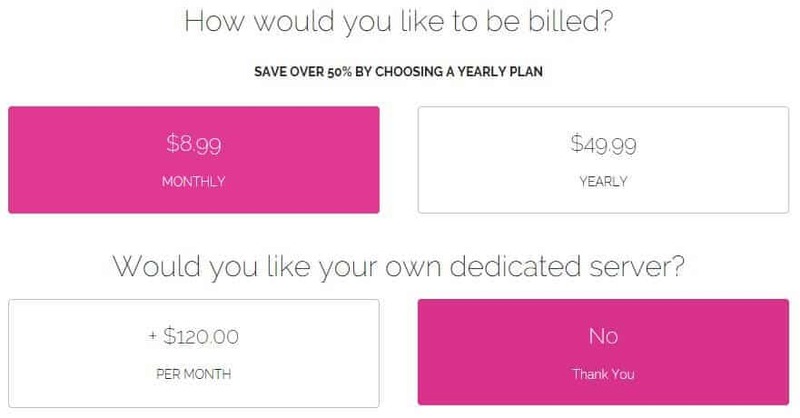 These prices are about average for monthly and annual plans, although many providers offer longer terms with steeper discounts. If you’re a business owner or manager looking to cover a team of people, you may be interested in Speedify’s Teams option. This gives you the same features as the individual plan but comes with additional functionality tailored to businesses, such as centralized account management, a teams management API, and a URL API for mobile apps. Paid plans all come with a generous 30-day money-back guarantee. Payment options include major credit and debit cards or PayPal. This is pretty limited compared to many competitors, and privacy-conscious users will miss the option to pay with bitcoin or other cryptocurrencies. Apps are available for Windows, MacOS, iOS, and Android. Linux is not supported, even via manual configuration. Many VPN providers are compatible with routers, but Speedify itself is not. However, Speedify’s parent company is Connectify. This company started out by offering a service that helps users turn their PC into a wifi hotspot. 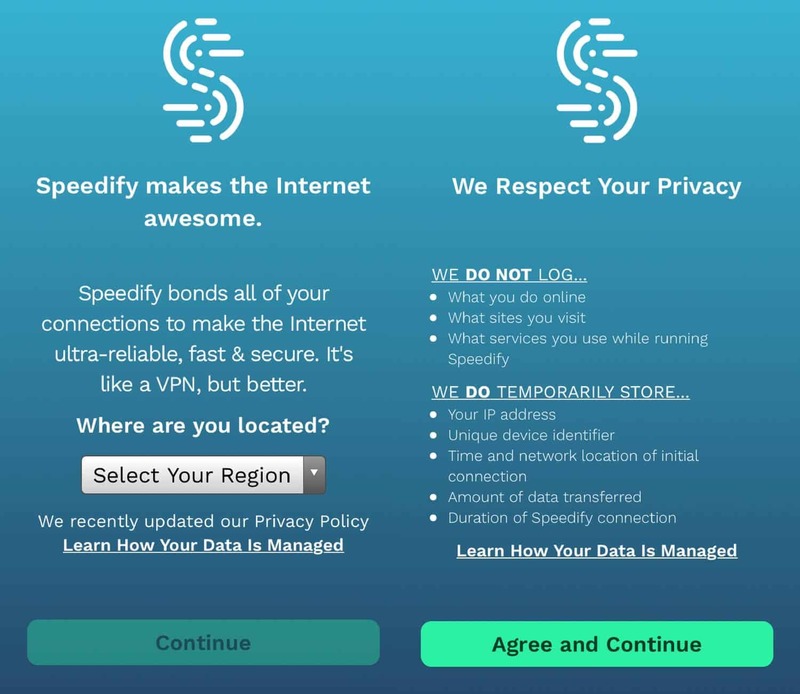 As such, Speedify plugs the Connectify service and recommends purchasing that in lieu of trying to configure a VPN with your router. While it’s a viable option, you then have to pay for the Connectify service on top of the Speedify package. Many VPN providers offer router configuration and the ability to create a virtual wifi hotspot (see our tutorials for Windows and MacOS). 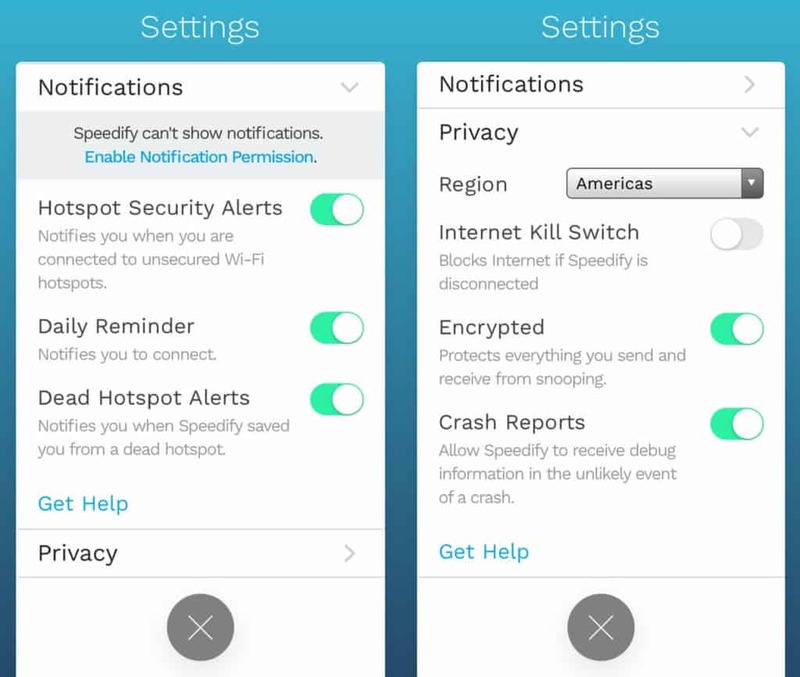 This is all under their basic VPN package, so the Speedify/Connectify combo doesn’t make economical sense. All plans give you access to a network of more than 1,000 servers in 32 countries. Security highlights include strong encryption, perfect forward secrecy, DNS leak protection, and a kill switch. With fast speeds, unlimited data, and the option to select torrent-friendly servers, this service is definitely an option for those looking to torrent. Speedify’s channel bonding feature differentiates it from competitors. Other VPN services simply work over one internet connection, just as each device typically only uses one connection at a time. However, Speedify’s service can combine multiple connections at once. In theory, and as the company claims, channel bonding should have two major benefits. One is improved speed because you combine the speed of multiple channels to create a faster “super-connection.” We tested this out and will reveal the results below. The other benefit is improved reliability: even if one connection drops, the other will remain intact. This means no disruption to browsing, streaming, or whatever else you happen to be doing online. Getting set up with Speedify is very straightforward. If you’re trying out the free plan, you don’t even need to provide any information. Simply download and launch the app, and you’re good to go. For the paid plan, once you’ve provided payment information and your email address, you’ll receive a series of welcome emails. One will include a link to help you set up your password. For the purposes of this review, we’ve been testing out the Windows desktop client and the iOS mobile app. Once you’ve downloaded and run the setup software, you can launch the app and enter your credentials. You’ll be greeted with the main screen of the app. It’s a little less sleek than that of many competitors, but it’s practical and easy to navigate. At the top, you can see your connection name and type. In the example below, you can see one wifi connection and the option to add another connection. If you have multiple home connections, for example, a standard wifi connection plus an ethernet connection, then you could combine them. Aside from that, you can also view whether you’re connected, how much data you’ve used, and the location of the server you’re connected to. The lower section of the screen gives you the option to run a speed test, which is handy for determining the effect of multiple connections. A slider takes you to additional information such as monthly and daily usage. Going back to the multiple connections, whether you’re in the desktop or mobile app, you can access settings for each connection by clicking on the relevant circle. Basically, you get to choose when and how to use each connection. This is especially important if you have a limited data plan with your provider. Overage charges can be very steep, so you want to avoid wasting valuable data. Going back to the main screen, in the middle of the screen, to the right of the server locations, you’ll see a gear icon. You can click this to change your settings. First, you have the Servers screen where you can change your server location based on country or city. To access the city options, simply click the arrow to the right of the country name to open another dropdown. Alternatively, you can choose the fastest server based on your location or a torrent-friendly server. The latter will direct you to a server that allows P2P protocols like BitTorrent. Below Servers, you have Session, where there are several options. First is Connect at Startup which simply forces a connection to Speedify every time you start up your device. Then there’s a toggle for Redundant Mode which sends traffic across all configured internet connections for optimal reliability. Transport Mode gives you the option to decide which tunnel protocol to try first or let the client decide for you. TCP and UDP are supported. Finally, you have the Privacy tab, which houses various security and privacy options. First, you’ll be asked to select your region. This is a new addition to the page, likely due to the new GDPR. The options remain the same for all regions, except Europe. If you select Europe, then you will no longer see the Optimization Data toggle. Presumably, this goes against GDPR so shouldn’t apply to European users. Below the region selection, you have DNS leak protection and the kill switch — note that both are disabled by default. The next option is Encrypted, which seems odd for a VPN. However, Speedify markets itself as more of a “channel bonding service” than a VPN. Deactivating the encryption should speed up the connection even further. Of course, it would no longer be secure without encryption. Lurking below that is Optimization Data. Enabling this means you “allow Speedify to collect network statistics for performance tuning.” It doesn’t detail what statistics they collect but this is definitely something we would recommend opting out of. Finally, Crash Reports simply enables Speedify to receive debug information in the event of a crash. When you first download and enter the mobile app, you’ll be asked what region you’re located in. Once you’re past that, you’ll see the main screen, which is very similar to that of the desktop app. Internet connections appear at the top with VPN connection data just below. 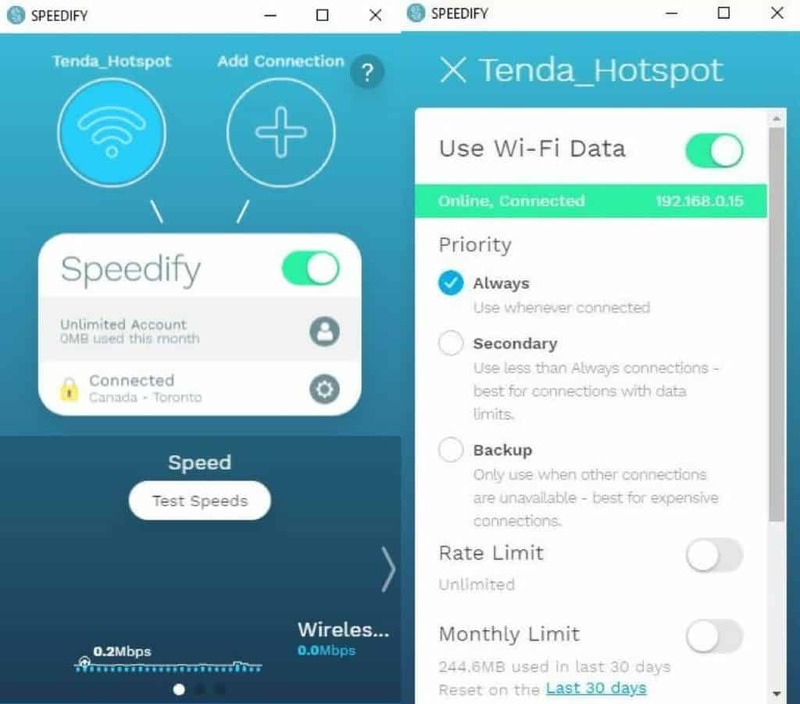 Note that if you’re connected to wifi and your device is connected to a cellular network, Speedify will automatically use both connections. You can click on each circle to remove each connection or change its settings. To access the Settings screen, you can click the gear icon next to the server location in the middle of the screen. Here you’ll see several options, the first being Servers. Just like in the desktop client, you can switch servers based on location, speed, or P2P capability. Next, you have Session where you can alter startup connections, enable Redundant Mode, or change settings for Transport Mode. The Notifications tab enables you to tailor settings for notifications and alerts, including a daily reminder to connect and security alerts. Finally, you have the Privacy tab where you can enable the kill switch, turn off encryption, and disable crash reports. Overall, it’s a robust app with a decent level of customization. It’s easy to use and won’t be overwhelming for beginners. Speedify operates a network of more than 1,000 servers spanning 32 countries. This is a relatively small network both in terms of the number of servers and number of locations. For example, NordVPN operates more than 4,000 servers while ExpressVPN’s network spans 94 countries. The servers are concentrated mainly in North America, Europe, and Asia, with just a handful of locations in South America, Africa, and Oceania combined. Servers can be selected based on country or city, or you can opt to connect to the fastest server for your location or a P2P-friendly server. We tested the service for multiple uses and found it to be problem-free. With the desktop client were able to compare “apples to apples” with respect to other VPNs. We just used one internet connection and the VPN service performed well. The connection was reliable and there were no issues while browsing, streaming in HD, or playing online games. When switching servers, connections were made very quickly, often within just a few seconds. Plus, you don’t have to worry about disconnecting first, which is a small point but does make for a better user experience. Of course, this relies on internal testing from the app so may not be completely reliable, but the channel bonding does appear to have a drastic effect on download speed and a smaller but positive impact on upload speed. So how does Speedify stack up compared to other VPN providers? We aim for our tests to be as empirical as possible so, in order to compare like to like, we tested Speedify with just one connection using a similar test method to the one we use for other VPN providers. These tests were conducted in Toronto and involved a single file (~100MB) being downloaded from a server in Oregon. For each provider, we ran tests on three sample servers in the US East, US West, and UK at three different times during the day. At each timepoint a control test was run without a VPN connection. Looking at the boxplots below, the median download speed for each provider is where its light and dark blue boxes meet. Lower is better. The overall size of the box is an indicator of the spread in results. Smaller is better. As you can see, Speedify fared very well in the tests. Speeds were only slightly slower than the control and were particularly fast when connected to a geographically close server. As expected, VPN servers further away delivered slower speeds, but they were still faster than comparably located servers for other providers. It’s important to point out that these tests aren’t definitive and can only serve as a general indication of the performance you might see. The inherent volatility of the internet adds a significant factor of randomness, so these tests should be taken with a grain of salt. They were run while using a 60Mbps connection, so you could see longer wait times with a slower connection, and maybe smaller or larger discrepancies. It’s pleasing to see this provider live up to its name and claims in terms of speed. And, of course, as demonstrated earlier, using the channel bonding functionality, you can expect to see a marked increase in the speed of the VPN connection if you add another internet connection. Yes, Speedify does unblock Netflix. We tested Speedify with multiple US servers and it worked to unblock US Netflix seamlessly every time. This is welcome news given that Netflix is cracking now on the use of VPNs to access its libraries and very few providers are able to unblock US Netflix. Even fewer can provide access to Netflix libraries outside the US, and this seems to be an issue plaguing Speedify too. It didn’t work to unblock Netflix UK or Netflix France, but you could try your luck with other libraries. We tested other streaming services with mixed results. Viewing BBC iPlayer content from outside the UK is becoming more and more difficult as the BBC cracks down on VPN connections. We couldn’t access it through the desktop client, but we did have success through the iOS app. Amazon Prime Video didn’t work with US servers but it was fine with a UK server. Does Speedify work in China? No, Speedify does not work in China. China’s Great Firewall is another area that’s proving difficult for VPNs to address. While some still do work in China, we were told by a Speedify representative that the service is unlikely to work there. It goes on to state that “We do not log IP addresses, sites, or data that you send or receive through the Speedify service.” The main connection logs we’re concerned with are IP addresses since these can be tied to an individual and potentially used to trace activity back to an individual. Speedify does offer strong encryption. If your hardware has AES support, encryption will be 128-bit AES. Otherwise, it’s ChaCha-based 256-bit encryption. These both come with perfect forward secrecy. The app comes with DNS leak protection built-in, but bear in mind it’s disabled by default. We tested for leaks without the protection enabled and none were observed, anyway. Speedify does currently use Google DNS servers, which isn’t ideal for privacy. Most paid VPN providers operate their own private DNS servers. Apps come with a built-in kill switch that halts all internet traffic should the VPN connection unexpectedly drop for some reason. Again, this is disabled by default. Both DNS leak protection and the kill switch can be enabled in the Privacy tab within the app settings. If you need help with Speedify at some point during setup or use, you don’t have a ton of options and you might have to wait patiently. There is an online knowledgebase, which is fairly comprehensive when it comes to setup guides but is a bit limited otherwise. We received a response about a week after the ticket was submitted. Granted there were several questions and it was not a troubleshooting issue, but nonetheless, this seems very slow. Another general question about Speedify’s logging policy was responded to within two days, which is much better but still not ideal. If you’re looking for fast speeds, strong security, and a solid option for streaming, Speedify could be a great choice. Just be wary that using the channel bonding feature could result in a serious drain on your data if you’re not careful. With unlimited bandwidth and P2P servers, in addition to its fast speeds, you’d think Speedify would be a good option for torrenters. However, because this provider logs IP addresses, it doesn’t provide the level of privacy most torrenters are looking for. Customer support is a bit slow and there’s no live chat feature, so beginners might want to explore different options. Users in China will also have to look elsewhere.